Today we sadly said goodbye to one of our key volunteers at Rockdale House, Margaret Lee. For nearly ten years Margaret and her partner in crime Penny have manned the Rockdale Shop for our residents offering them the opportunity to personally purchase that extra little something they fancy or need. 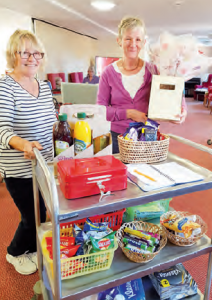 For our residents who find it more difficult to get to the shops the weekly visit of the Rockdale Shop, on Wednesdays, has proved invaluable and the time they spend at both Rockdale House amongst residents, as well as on their frequent trips to the supermarkets to stock up, is greatly appreciated. On the other hand, we are delighted to announce that long term Rockdale friends Maggie Collins will be taking over Margaret’s role working alongside Penny. Maggie worked in Rockdale House for 12 years and, therefore, for some residents will be a welcome and familiar face behind the tills and the chocolate bars!